We're delighted to work with the following partners who provide tremendous help in order to bring the Run to life! The Bonhams London to Brighton Veteran Car Run is one of the world’s longest standing and most famous historic motor car events, and Bonhams is delighted to partner the Royal Automobile Club as title sponsor. 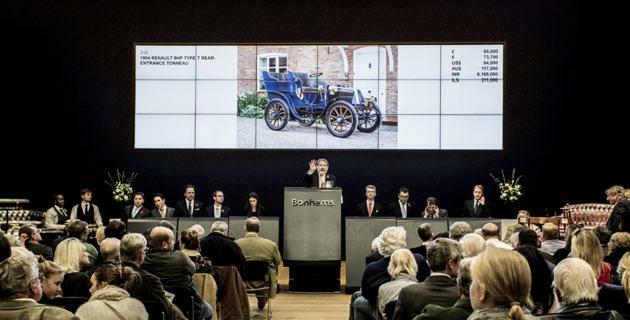 Many of the Bonhams team participate on the Run, with many driving their own motor cars. We are not just auctioneers, but very much active enthusiasts who enjoy – like our clients and customers – the hobby of old motoring. Over several years, we have helped grow the Run in to a whole weekend of veteran car activities. It commences on the Friday with the annual Bonhams sale of London to Brighton eligible motor cars and early automobilia. Some motor cars in the auction are even offered with an entry into the Run, so you can "buy on Friday, drive on Sunday". Iconic department store, Harrods, is poised to take to the road once again and join in this year’s Bonhams London to Brighton Veteran Car Run. The first time the Knightsbridge establishment took part was in the inaugural emancipation run of 1896. After purchasing and restoring an original 1901 Pope Waverley car in 2013, Harrods Store Operations Director James Healy will join the other intreped participants in what is hoped will be another successful Run. However, with many twisting roads and steep hills, not to mention a maximum of 18mph, this will be no mean feat for the Harrodian team to conquer. Furthermore, Harrods is proud to officially sponsor the Participants' Reception which takes place on the eve of the Run, bringing a touch of Harrods luxury to an already beautiful venue. Bonhams London to Brighton Veteran Car Run is proud to be working with the Movember Foundation. This year, we come together for a purpose, to tackle men’s health issues. The Movember Foundation is the only charity tackling men’s health on a global scale, year-round. They’re addressing some of the biggest health issues faced by men: prostate cancer, testicular cancer, and mental health and suicide prevention. We would love for all participants, volunteers, supporters, friends and family to get involved and join the movement with us. Your moustache makes a difference. Whether it’s a Trucker, Regent, Connoisseur or Wisp – no matter the shape or style, your face can inspire donations, conversations and real change. So this year, pair your dapper attire with a distinguished Mo and fundraise in the process. There will be prizes for the biggest and best. You can set up a fundraising page individually or as a team. Click here to Join up and keep up to date with other fundraisers, share ideas, donate to other participants, and follow the leaderboard. There are lots prizes to be won, including limited edition merchandise and more. Show your support by purchasing a Carstache for your veteran car on the Run. You can buy one during your online entry process or from our online shop. All funds raised will go to the Movember Foundation to help them tackle men’s health issues. Your donation will help us to continue what we’ve started and fund world class programmes that are saving and improving the lives of men. Thank you – together we are changing the face of men’s health. Abels Moving Services enjoy a rich moving heritage and is a perfect fit for the role of Bonhams Veteran Car Run Official Supplier for the luggage transfer service from London to Brighton. Testament to this is the Royal Warrant they were awarded in 1989 - a proud honour which they have held to this day. Philip Pertoldi, Abels Chairman is delighted to be part of such a famous and historic event. "It is a prestigious occasion and is a perfect fit with Abels own traditional and cultural values." 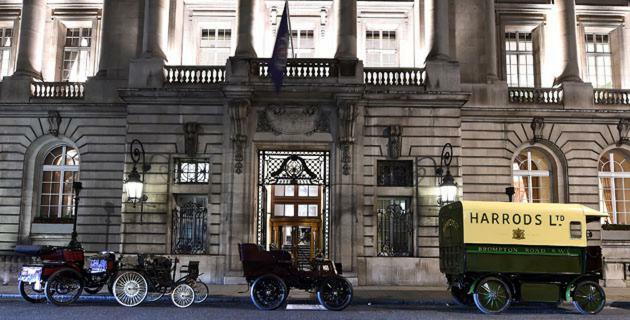 The removal company proudly owns an 1896 horse-drawn removal pantechnicon (as used in days gone by for the movement of personal possessions), which they are honoured to showcase at the Illinois Route 66 Regent Street Motor Show the day prior to the Run. The removal trucks used to transport the luggage from London to Brighton are thankfully more modern and come equipped with state-of-the-art technology. They are operated by highly trained and skilled teams who carefully handle cherished belongings and deliver them safely anywhere around the world. Participants in the Bonhams Veteran Car Run can have the utmost confidence in the cosseted care that their belongings will receive once they have handed them to the Abels team. 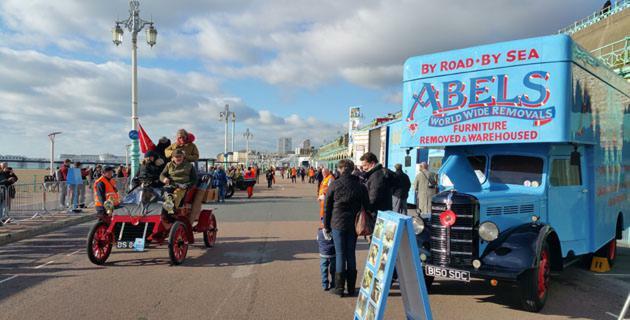 Brighton and Hove City Council are delighted to be an Official Supplier of the Bonhams Veteran Car Run. The Council has a long established history with the Run and supports it by providing infrastructure and logistical support. For more information about Brighton, please visit www.visitbrighton.com. 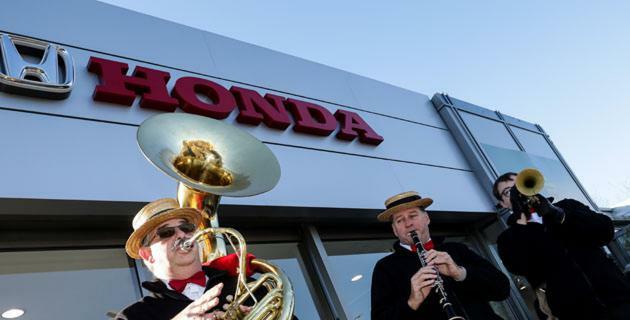 Honda dealerships located in Crawley and Redhill are once again proudly supporting the Bonhams London to Brighton Veteran Car Run as the Official Vehicle Suppliers. Honda has nearly 200 retailers throughout the United Kingdom and the event is delighted to be associated with such a prestigious and exclusive brand. Throughout the weekend the dealerships will jointly provide a fleet of official course cars and for the very first time in the Runs history, the Honda Gatwick dealership (located in Crawley) will be hosting the Halfway stop at Crawley, providing a welcome refreshment break for all participants. Since 2012 Honda Redhill has provided a safe place to stop along the route with its mechanics always willing to lend a hand for an oil change or a push up the hill and we are very grateful for their continued support of the event. 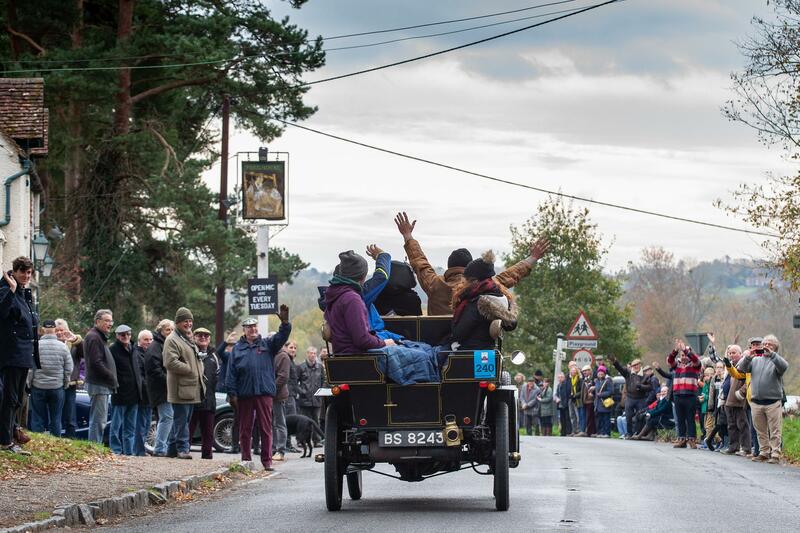 RAC Motoring Services are delighted to be the breakdown supplier to the Bonhams Veteran Car Run. Our longstanding partnership dates back many years. The event is the world’s oldest motoring events, first run in November 1896 the year before The Royal Automobile Club was formed, and is hugely popular with car enthusiasts the world over with a reputation for celebrating our motoring history and bringing together some of the UK’s top classic vehicles and their owners. 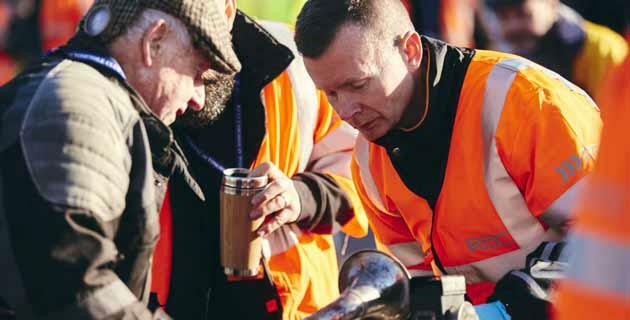 The RAC offers technical support for the 60 mile run from Hyde Park, London to the seafront in Brighton providing breakdown assistance and recovery with the committed support of around 30 dedicated patrols who come from across the UK to lend their support. Our support provides participants with peace of mind that no matter what happens, they are in safe and trusted hands. With over 120 years’ experience supporting motorists, there is no better organisation than RAC Motoring Services to support and assist the participants and their veteran cars.